Beautiful looking loaves of bread...good job. Jean, I totally understand your craving for simple white bread: nothing quite beats that baking smell. I do hope your hand recovers quickly. Jean, your sandwich loaves turned out bakery perfect! My husband will love it since he loves white bread. Thanks, Pauline. 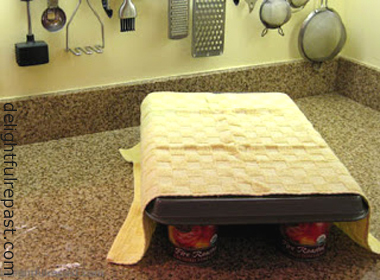 AND it is so perfect for tea sandwiches! Thanks, Sully. And, no, Mr Delightful won't be making chicken soup for me today; he'll be having CTS surgery! Angie, thank you. Homemade white bread is soooo good! Your husband should try my recipe! Thank you, Mildred. Yep, the frustration has set in. Enjoy that wonderful Irish butter - it's sooo good! Oh Jean, hand surgery is never fun for anyone who loves to cook. When they say you can do it with one hand tied behind you're back we know the truth. A good cook can't. Those hands are tools. Especially for bread! Well, I've not seen this one before so I'm glad you reposted it. I 'll share with the resident bread guy! You're so right, Jeanie - I need both hands, my best tools! Hope the resident bread guy of yours gives the bread a go! I hope you and Mr Delightful get better soon.That bread looks delicious!Hugs! Thank you, Maristella! Hugs to you. Oh Martha, I'm glad you noticed that! :-) Yes, I think we'll be better than new fairly soon, thanks. YUM! There is nothing better than homemade bread. Happy weekend, dear Jean. Hugs! Beautiful loaves and I wish I could enjoy the aroma of your kitchen while the bread was baking. Thank you, Kate. Yes, home-baked is so much better. Stephanie, thanks. And hugs to you. Your bread would be perfect for dainty tea sandwiches. Wishing your hand a speedy recovery! Thank you, Margie. I should be ready to knead some dough next week. I especially like this bread for cucumber sandwiches. I have baked all sort of sweet bread but not this one, I need to give this wonderful bread a try.. Since I've been to culinary school and spent many hours in the pastry kitchen - making bread, I've really been on a bread binge at home. I try to make it once a week. Thanks for a new recipe to try! Pinning. T and T, thank you so much. I hope you will. And let me know how it turns out for you. Lea Ann, I've been on a "bread binge" (love that term!) since I was a young girl. Nothing wrong with that! Thank you AND thanks for Pinning. Hello, I think anything homemade taste better than the store bought. Your bread look delicious. Baking bread just smells delicious. Thanks for sharing. Happy Friday, enjoy your weekend! Thanks, Tony. Yes, getting better, should be kneading dough in no time! People get hung up on the kneading because they think it has to be done a particular way. As long as you're smooshing and folding the dough, it doesn't really matter exactly how you do it. Where most people go wrong is that they don't do it long enough (and/or they add too much flour). It takes 5 to 10 minutes. Just smoosh it away from you with the heel of your hand, fold it back toward you, rotate the dough a quarter turn (no need to be precise about that), repeat. Smooshing and folding. Let me know how it goes. Oh Jean, I hope your hand heals quickly from your recent surgery. I know how much you love cooking and baking. Your bread looks wonderful, and you know me, I'm a regular bread baker. I'm not snobbish about food, but do have to have my homemade bread toasted for my breakfast, plus I love giving loaves away. Thank you, Eileen. I try to limit my bread intake these days, but even if I just have one delicious slice, the best part is the kneading (therapeutic AND good exercise!) and the aroma of it baking! Kitty, thank you. Now that I have the big bandaging off, I can type a little better. I'm going to try kneading some dough (with a rubber glove on the hand) next week. I know you love your daily homemade toast - and I bet giving loaves away makes you very popular (not that your sweet personality isn't enough to do that)! Jean, I hope you heal up quickly from your hand surgery. I dodged the surgery this time around, thank goodness! I made bread a lot when I was first married but once the babies started coming, I didn't have time. Now, I can't knead bread for different reasons. Oh my, your bread looks so good! Nothing trumps fresh bread from the oven. Hubby and I are trying to limit our bread intake these days too. If I did have home made bread around, I'm afraid I would pig out on it because it's my favourite. I do however have to give in from time to time and savour a nice tea sandwich, with the crusts cut off of course. Hope you have a splendid weekend and I hope your hand is up to kneading bread soon. Take care! Sandi, thank you so much. Glad you dodged surgery! Ohhh yes, we must save our limited bread allowance for tea sandwiches! :-) I'm so excited, I get to go out for afternoon tea in a few days! Is it wrong of me to LOVE white bread? I know I am supposed to want whole-grain breads and such, but I just love white bread. Especially for a BLT with homegrown tomatoes! Or a cucumber sandwich. Or, honestly, still warm from the oven with French butter. I will have to compare your recipe to my Gramma’s - I think they are very similar. I hope your hand heals well. That must be tough for a blogger! And I appreciate that you don’t repeat recipes... I try not to, either, unless I am updating it! No, David, it is NOT wrong of you! We like some whole grain breads, but there are certain things that simply CALL for good white bread. Whether I'm using organic white flour or organic whole grain flour, it's organic, it's non-GMO, AND it is still a "simple carb," which I'm trying to limit. So, to my mind, a small amount of either is fine! That is a great point, Jean! It is just so hard to limit carbs when they are your first love and best friend! I know what you mean, David! I love bread and pastry and all that, so since none of it is "good for you," I'm going to have exactly what I want and eat something else for nutritional value! Get well soon. We take our hands and feet for granted until we can't use one of them. Your white bread sounds delicious! I haven't made regular loaf bread in a long time. I'll have to give it a go!! Take Care!!! Thank you, Marisa. It seemed like it would never get better, but today it took a leap in improvement. You're right, we take it for granted. While my husband was waiting for me to come out of surgery, he saw a teenage girl come in who had lost a hand. Suddenly our troubles seemed small. Marilyn, thank you. I usually make bread at least twice a week, so this is frustrating. I think even if I have to develop a one-handed kneading method, I'm simply going to have to try it in a few days. A light and airy honey and oatmeal loaf sounds wonderful, too. Thanks, Karen. And if I can manage it with my hand in a few days, Thursday I'll be posting another yeast recipe I think you'll like. I hope you have a wonderful weekend, too! This must be delicious and good for health. I hope your hand get well soon. Thanks, Karen! I'm counting the days (6) till the stitches come out. RTC, thank you. Only a few more days of store-bought bread, I hope! I hope your hand heals quickly! Thank you for commenting on my blog. Had you not done that, then I wouldn’t have found you, and now I am your newest follow work. I hope you recover soon from your hand surgery, but in the meantime I think I’m going to try this bread. I have been on a real bread baking tear lately (yesterday I made a delicious loaf of rosemary and sea salt), but I haven’t made classic white bread, believe it or not. I will be trying it this week. Thanks again, great post, and like they say, if you haven’t seen it it’s new to you, so this post was new to me. Pattie, thank you! Have fun with the bread, and do let me know how it turns out for you! It's never a bad idea to bring a good post forward again, Jean - you'll always have new eyes for it! I hope you are recovering well from your hand surgery. Your Classic White Sandwich Bread looks lovely - light and delicious. It's definitely perfect for tea sandwiches. Take care and hope you are feeling a hundred percent again very soon! Thank you for being a part of the Hearth and Soul Link Party. Thank you, April. Went out for afternoon tea yesterday and had some lovely tea sandwiches -- my favorite tier of the 3-tiered stand! Couldn't help thinking they would have been even better on my homemade bread! Much as I enjoy so many fancy and complicated breads I just love to get back to classic bread like yours on a regular basis. You're making them look so inviting. You're also making me feel a little lazy or badly organised. I very rarely find the time these days to make any sort of bread without the help of as many machines that I can lay my hands on. Speaking of hands I hope all is going well and you're back to double handedness as soon as possible. Hi Jean! I've never made bread but I could almost smell the delicious aroma of freshly baked bread reading your post. Thanks for sharing with us at #BloggersPitStop and hope you hand is okay soon. Phil, thank you so much. At the earliest possible moment, I'll have my hands in some dough, to be sure! Thank you, Sue. You should try it. But be warned, that aroma is highly addictive! Homemade bread is glorious! Thanks for sharing at our To Grandma's House We Go DIY, Crafts Recipes and more Wednesday Link Party! Hope to see you again this week! I am still trying the bread loaves but so far I haven't like the way it comes out for me. I think that with hand issues the problem is kneading. A little "equipment" would help! Thanks for sharing and I am going to keep trying. Nothing beats good homemade bread and your loaves look amazing! Now I'm in the mood to bake. I am so glad that you reposted this! It will be the perfect addition to the leftover corned beef I am planning to serve tonight. Thank you, Sheri. I think homemade bread and bready things are my favorite food! Carlee, thank you! 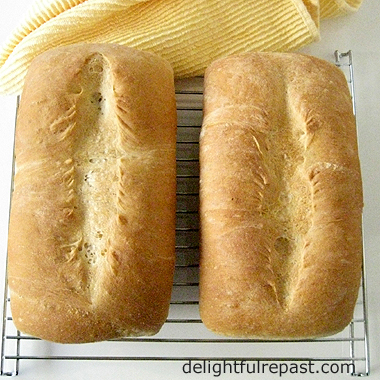 I'm always in the mood to bake bread -- I think it's addicting! Laura, thank you. Sounds delicious! I can almost smell this fantastic bread as it comes out of the oven! 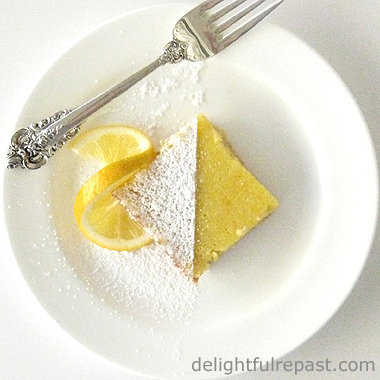 Have a great first week of spring and thanks so much for sharing your awesome post with FULL PLATE THURSDAY! That's what I always say! Thanks, Greg. Thanks, Miz Helen! I hope you have a beautiful spring. Jean, how awesome to bake your own bread. I need to keep trying. Thanks for sharing your post at Dishing It & Digging It. Linda, thank you. And you can soooo do this - just follow my step-by-step! That recipe sounds good. Thanks for stopping by anointedtoday.blogspot.com. Delicious. 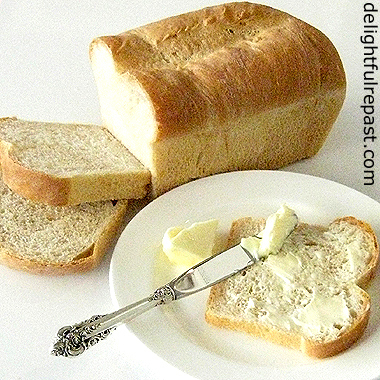 Nothing beats freshly baked bread and butter. Hand surgery?! Hope you're recovering from that. And your bread is gorgeous! Great recipe, wonderful pictures. Thanks! Thanks, John. I get the stitches out tomorrow, and I hope that will be the end of having to glove up for everything! Bread is my "thing" and I just had to knead some dough yesterday, even if it was mostly one-handed! I just made baked loaves yesterday morning to take to a bereaved neighbor family. Almost everyone loves fresh homemade bread, right? It seems maybe more universally enjoyed than a casserole, plus you don't have to worry about trying to keep it hot or about food likes/dislikes. Maybe. And besides, I just love baking bread. When there's a fire in the stove, as there is today and as there was yesterday, it seems the thing to do. Judy, what a great idea! I've never thought to make bread in that situation. I'm going to remember this! Interesting that you let the dough rest overnight before kneading it. I've done it the opposite way around, letting it rise overnight after kneading it. Does it make a difference which order it's done in? Ellen, lots of different ways work. This is just how I do it. Some people just get on with it and don't give the dough a long rest at all, but I like to do it because it builds flavor.